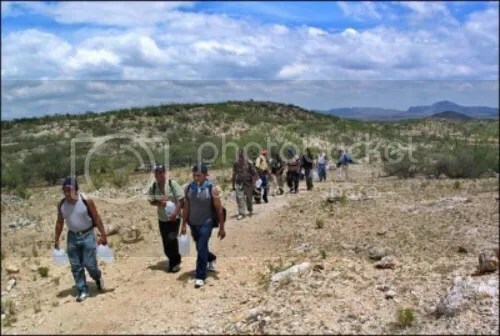 Migrants walking from Mexico to the United States border. Every summer while I was in middle school, my parents would send me to my grandmother’s house. She lived with my Uncle Simon in Grimes, California, a small town along the Sacramento River. My grandmother had emigrated from Mexico in the 1930s. Eventually, she and her husband established a migrant worker cooperative farm. The workers were paid, housed and fed for as long as they wished to stay. After my grandfather passed and the farm was retired, my Uncle Simon continued to help migrant workers by establishing a consultant business. My uncle would meet with migrant families, advise them on gaining citizenship, and draft requisite documents. He did this all despite being a quadriplegic. When I came to visit, I was his ‘Assistant’. I answered the door, procured refreshments, and fetched documents that were out of wheelchair range. When he passed away two years ago, a flood of affection rushed to the house in the form of flowers, food, and letters of appreciation. He was a hero  to the people he helped. My family history, along with Uncle Simon’s work, gave me a vested interest in immigration. As of now, 11 million undocumented people live in the US. Consequently, immigration reform has been on Capitol Hill for decades. Though it is perceived as a liberal issue, two recent Republican presidents have broached immigration reform: Presidents Bush and Trump. That said, I would like to examine President Bush’s ‘Guest Worker Program’ in relation to President Trump’s ‘Merit-Based’ system in effort to devise a new strategy. DDT fumigation of a Bracero. (Leonard Nadel). Comparatively, there are significant differences between Bush and Trump’s immigration proposals. First, Bush sought to provide undocumented low-skilled workers with temporary residency as an avenue for achieving legal status. Likely, Trump’s system would not offer a similar route and instead provide visas to skilled foreigners while dealing with undocumented workers through deportation. Secondly, Bush predicated visa allocation on job demand. With Merit-Based programs, entry is not based on demand, but rather on skill level. Thus, low-skilled workers would be precluded under Trump’s approach because they do not meet the visa qualifications. That said, how should Congress address undocumented worker status and our country’s need for cheap labor? Well, my approach, while overly-simplistic, mirrors Bush’s program and emphasizes economic integration. First, a five-year visa would be provided to undocumented workers. A five-year period offers ample time to gain experience, establish contacts, build resources and become proficient participants in the US economy. Secondly, the program would include counseling services. For example, workers would be advised on acquiring citizenship and receive instruction on how to navigate the American financial system. Also, contact information for legal services would be provided. So, in case they fall victim to labor law violations, the worker can contact a free legal clinic for advice. Additionally, the worker would be provided educational resources. This would include English language programs and information about enrolling children in grade school and college. Lastly, workers would be taxed as regular employees. For instance, the worker’s paycheck would include deductions such as federal and state withholding taxes, and they would file a return each year. However, like Bush’s program, Social Security would be placed in a trust. The trust funds would be released into the US Treasury or their native countries program depending on where the worker eventually resides. In all, the worker contributes to the US government’s coffers and retains earned benefits. Overall, this proposal attempts to achieve two things. First, to transform undocumented people into informed taxpaying workers. Secondly, it seeks to honor migrant worker contributions to the US economy by offering legal residency or citizenship. Thus, we can keep our current ‘skilled-worker’ program, and provide essential low-skilled workers with a dignified avenue for economic and social integration. This was important when I was my Uncle’s ‘Assistant’, and it is essential now to our economy and the 11 million undocumented people living in our country. Click on the hyperlink for an excellent profile on the life of my Uncle Simon Robles. Jordan, M. (2016). Number of Illegal Immigrants in US Holds Steady at 11 Million. The Wall Street Journal. Retrieved from https://www.wsj.com/articles/number-of-illegal-immigrants-in-u-s-holds-steady-at-11-million-1474394518. Bumiller, E. (2006). Bush is Facing a Difficult Path on Immigration. The New York Times. Retrieved from http://www.nytimes.com/2006/03/24/politics/bush-is-facing-a-difficult-path-on-immigration.html. Morgan, K. (2004). Evaluating Guest Worker Programs in the US: A Comparison of the Bracero Program and President Bush’s Proposed Immigration Reform Plan. Berkeley La Raza Law Journal. 15(2). Retrieved from http://scholarship.law.berkeley.edu/cgi/viewcontent.cgi?article=1191&context=blrlj. Jachimowicz, M. (2004). Bush Proposes New Temporary Worker Program. Migration Policy Institute. Retrieved from http://www.migrationpolicy.org/article/bush-proposes-new-temporary-worker-program. See the Smithsonian Institute’s ‘America on the Move’ (2017) for images and an overview of the Bracero Program. http://amhistory.si.edu/onthemove/themes/story_51_5.html. Alvarez, P. (2017). Is a ‘Merit-Based’ Immigration System a Good Idea?. The Atlantic. Retrieved from https://www.theatlantic.com/politics/archive/2017/03/trump-cotton-perdue-merit-based-immigration-system/518985/.